ShoppyTool is the PUP that uses misleading techniques to prevent removal. Use Reimage to locate malicious components and get rid of them faster than with uninstall instructions. A full system scan blocks virus reappearance and prevents traffic to malicious domains. What does ShoppyTool virus do? How to avoid installing such programs? 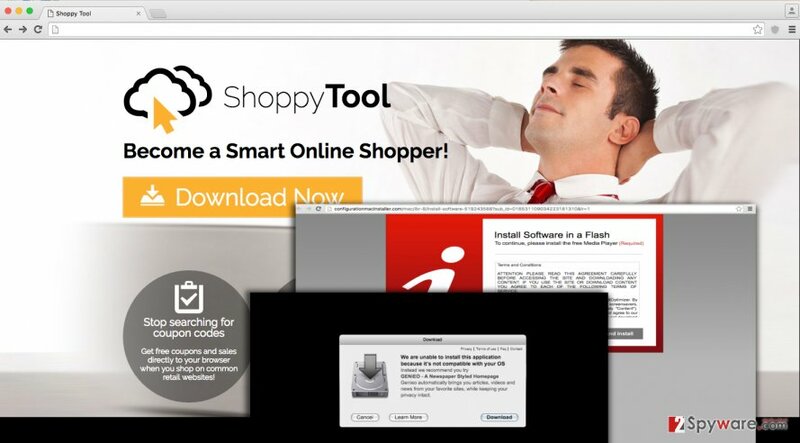 Shoppy Tool is a potentially unwanted program, which can affect Mac users. It falls into adware category, and it is known for the ability to take control over Internet browser and inject various sponsored content into websites that the user visits, as well as launch them in separate browser windows or new tabs. These ads are typically labeled as “Shoppy Tool ads” or “ads by Shoppy Tool,” so it won’t take long to realize where do these ads come from. However, it can be a surprise for some computer users, especially if they didn’t do anything to find and download this adware on their own. The reason why this application appears in user’s computer is if the user fails to install software correctly, misses important settings and agrees to install optional applications without even knowing that they exist. If you want to learn how to avoid installing these programs unconsciously, continue reading below. First of all, we would like to explain why it is not worth trusting ads that this application displays. Despite the fact that it promises to deliver relevant and targeted advertisements, which can save user’s time and money, in reality, it is not the real aim of developers of this app. In fact, they pretend that they provide a beneficial tool free of charge, in reality, they want to use the computer user as a tool for Internet advertising model, known as pay-per-click. To put it simply, the developer of this adware gets paid for every single click users make on these annoying ads, because then users get redirected to third-party websites that want to be promoted. The sad part is that not all of these websites are safe. What is more, the developers of this adware state that they do not have control over the content of ads and that they do not endorse them. They suggest that “You are solely responsible for your choice to access or rely on any Deals, and you do so at your sole discretion and risk.” We believe that you should think twice before clicking on ShoppyTool advertisements as they do not seem to be very reliable. If you would like to stop receiving these ads, you have to remove Shoppy Tool from your computer. Reimage anti-spyware software can be used for that, but if you want to, you can try to delete this ad-supported software manually. Here, look for ShoppyTool or any other recently installed suspicious programs. Wait until you see Applications folder and look for ShoppyTool or any other suspicious programs on it. Now right click on every of such entries and select Move to Trash. When in the new window, check Delete personal settings and select Reset again to complete ShoppyTool removal. Once these steps are finished, ShoppyTool should be removed from your Microsoft Edge browser. Here, select ShoppyTool and other questionable plugins. Click Remove to delete these entries. Now you will see Reset Firefox to its default state message with Reset Firefox button. Click this button for several times and complete ShoppyTool removal. Here, select ShoppyTool and other malicious plugins and select trash icon to delete these entries. Click Reset to confirm this action and complete ShoppyTool removal. Here, select Extensions and look for ShoppyTool or other suspicious entries. Click on the Uninstall button to get rid each of them. Now you will see a detailed dialog window filled with reset options. All of those options are usually checked, but you can specify which of them you want to reset. Click the Reset button to complete ShoppyTool removal process. This entry was posted on 2016-07-21 at 06:03 and is filed under Adware, Viruses. You can quickly scan the QR code with your mobile device and have ShoppyTool ads manual removal instructions right in your pocket. How did you remove ShoppyTool ads?